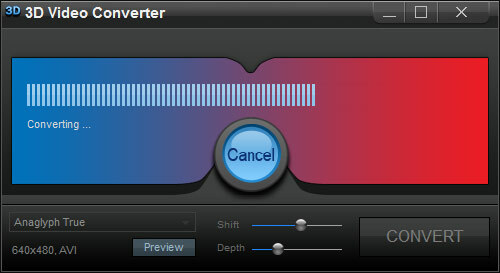 How to install and activate my 3D Video Converter? Side by Side (Half-Width), Top and Bottom, Top and Bottom (Half-Width). Click "CONVERT" for the conversion to the desired 3D format to start. 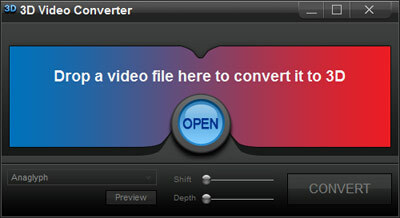 "converted to 3D" video file in the pop-up folder "3D Video Converter Output". Your 3D video is now ready for watching! on your PC, choose the footage you'd like to convert to 3D and voila - your converted 3D video is ready! How to achieve maximum 3D effect using 3D Shift and 3D Depth controls? You can achieve maximum 3D effect in your converted video by adjusting 3D Shift and 3D Depth controls as you desire. We recommend 75% 3D Shift and 50% 3D Depth levels. Please note that these controls work in "Anaglyph", "Anaglyph True" and "Anaglyph Grey" 3D modes only. 1. Click "OPEN" to choose the regular video file, which you'd like to convert from 2D to Anaglyph Red Cyan 3D format. Then in the drop-down menu of 3D techniques please set either Anaglyph, Anaglyph True or Anaglyph Grey mode. After that please click "Preview" in 3D Video Converter to adjust 3D Shift and 3D Depth controls in the opened 3D Video Player. Meanwhile, do not close 3D Video Converter - you'll need it later. 2. In the opened 3D Video Player please tweak 3D Shift and 3D Depth controls as desired. When satisfied with the chosen settings of 3D effect in the preview of your future 3D video please stop the playback and close 3D Video Player. 3. 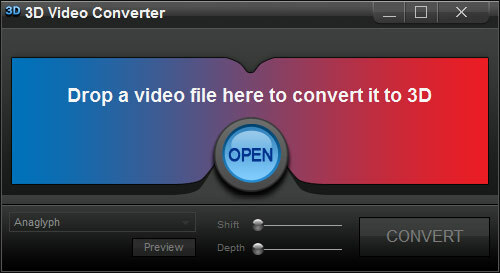 Now please get back to your 3D Video Converter and start the actual conversion to 3D format by clicking on the "CONVERT" button. Please notice that the settings of 3D Shift and 3D Depth you've just adjusted in 3D Video Player will appear in the output converted video. 4. Wait a couple of minutes for converting of the file to finish and enjoy your converted 3D video in any multimedia player or hardware device of your choice. Put your red cyan 3D glasses on - other types of glasses won't work with your converted red cyan 3D video. Have fun!